An ice dam can form when water from melting snow re-freezes at the edge of your roofline. Without roof snow removal, the ice dam may grow large enough to prevent water from draining off the roof. The water can the back up underneath the roof shingles and make its way inside your home. Remove snow from your roof after every storm. Use a roof rake to clear the first three to four feet of snow from your roof immediately after each winter storm to prevent ice dams from forming. While the amount of snow and ice that your roof can handle may vary depending on a number of factors such as the roof type, age and condition of the structure, a good rule of thumb is if there is more than a foot of heavy, wet snow and ice on your roof, you should try to have it removed. Clear downspouts. An easy way to help snow and ice drain off your roof is to make sure the area around your downspouts is clear. This will make it possible for your gutters to drain when snow does melt. It will also help prevent flooding when the snow and ice melts. 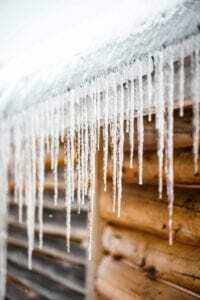 Ultimately, the best prevention for ice dams is to eliminate the conditions that make it possible for them to form in the first place. Insulate your attic. Make sure your attic is well insulated to help prevent the melting-and-freezing cycle that causes ice dams to form. Check and seal places where warm air could leak from your house to the attic, including vent pipes, exhaust fans, chimneys, attic hatches and light fixtures. Install a water-repellant membrane. When replacing a roof, make sure to have a water membrane installed underneath the shingles. This acts as an extra barrier that helps prevent water from seeping inside the building. Just because an ice dam is present does not necessarily mean water has penetrated the roof membrane. However, it is always best to remove ice dams before they have the opportunity to cause damage. To determine if you have damage, look for water stains or moisture in the attic or around the tops of exterior walls on the top floor or contact MXI for a free roof inspection. If you can reach the roof safely, try to knock the ice dam off with a roof rake, or cut a channel through the ice to allow standing water to drain. If you cannot reach the roof safely, consider hiring a contractor to remove it. Another method is to fill a nylon stocking with calcium chloride ice melt and place it vertically across the ice dam so that it melts a channel through the dam. If you try this method, make sure you can safely position the ice melt on your roof, and make sure to use calcium chloride, not rock salt. Rock salt will damage your roof. Also be aware that shrubbery and plantings near the gutter or downspout may be damaged. Look carefully at large icicles. If the icicles are confined to the gutters and there is no water trapped behind them, this does not indicate the presence of an ice dam. However, large icicles can pose a danger to people when they fall off. Try to safely knock the icicles off from the ground, making sure not to stand directly beneath them. If you cannot reach them safely from the ground, consider hiring a contractor to help. Keep in mind that the cost of snow removal is likely to be considerably less than the cost of roof damage or interior property damage caused by water leak.